Our company shall offer agency services for all the vessels operation between ports of Arkhangelsk and Dudinka carrying various cargoes to that northern port for the needs of OJSC "MMC "NORILSK NICKEL". We are very proud that after the prolonged negotiations with several Arkhangelsk shipping agencies our company was chosen, and we shall carry out our obligation to the maximum of our abilities! 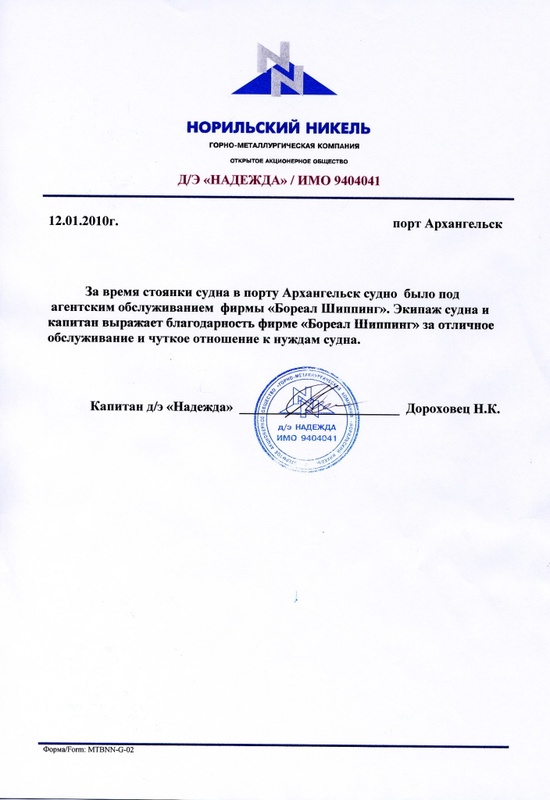 Already, after just a single visit to port of Arkhangesk, the Captain of m/v Nadezhda has highly appreciated the job of our agents - and Mr. Vadim Surov in particular - via a letter of recommendation.